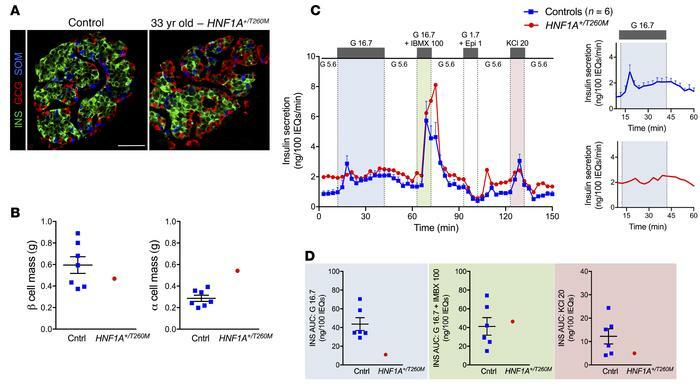 Histological and functional analysis of HNF1A+/T260M pancreas and islets. (A) Example of expression of insulin (INS), glucagon (GCG), and somatostatin (SOM) in donor’s native pancreatic tissue compared with control. Scale bar: 50 μm. (B) β and α cell mass (grams) in HNF1A+/T260M pancreas compared with controls (n = 7 donors; ages 10–55 years). Each data point represents the average mass across the combined pancreatic head, body, and tail regions. (C) Insulin secretion in islets isolated from the HNF1A+/T260M pancreas compared with controls (n = 6 donors; ages 8–55 years) and normalized to overall islet cell volume (expressed as islet equivalents, IEQs). Islets were teated with 5.6 mM glucose (G 5.6); 16.7 mM glucose (G 16.7); 16.7 mM glucose plus 100 μM isobutylmethylxanthine (G 16.7 + IBMX 100); 1.7 mM glucose plus 1 μM epinephrine (G 1.7 + Epi 1); or 20 mM potassium chloride (KCl 20) at the indicated times. Insets show average insulin response of controls and HNF1A+/T260M donor to 30-minute stimulation with 16.7 mM glucose. (D) Integrated insulin secretion was calculated as the area under the curve (AUC) for the indicated secretagogue (shaded to correspond to color-matched regions of perifusion trace in panel C). Results of control samples are expressed as mean ± SEM.